Map of France's Roquefort Cheese region. 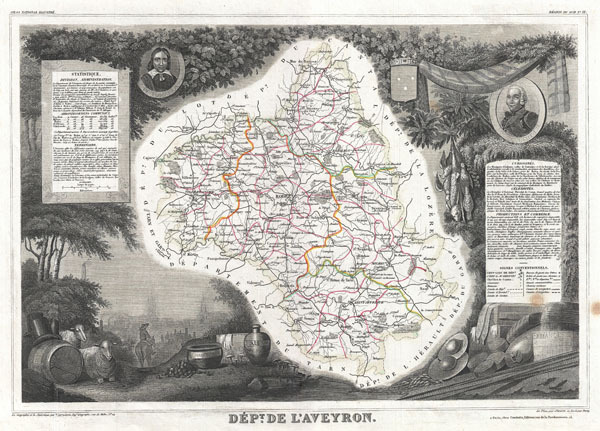 This is a fascinating 1857 map of the French department of Aveyron, France. This area of France, centered on Rodez, is famous for its production of Roquefort, a flavorful ewe's milk blue cheese. This region is also known for the legendary Bete du Gevaudan, a terrible man-wolf who terrorizes the countryside. The Chemin St. Jacques also passes through the northern part of this department. The whole is surrounded by elaborate decorative engravings designed to illustrate both the natural beauty and trade richness of the land. There is a short textual history of the regions depicted on both the left and right sides of the map. Published by V. Levasseur in the 1852 edition of his Atlas National de la France Illustree. Very good. Blank on verso. Minor spotting lower right quadrant.